A master teacher, Peggy Baker teaches regularly at universities and professional training programs throughout Canada and the U.S. including the Juilliard School, the School at Jacob’s Pillow, American Dance Festival, NYU, UC Santa Barbara, Philadelphia’s Dance Advance, York University, the University of Calgary, The School of Toronto Dance Theatre, and the Contemporary Arts Summer Institute at Simon Fraser University. She is the first ever Artist-in-Residence at Canada’s National Ballet School, appointed in 1992, where she teaches students in grades 10-12. 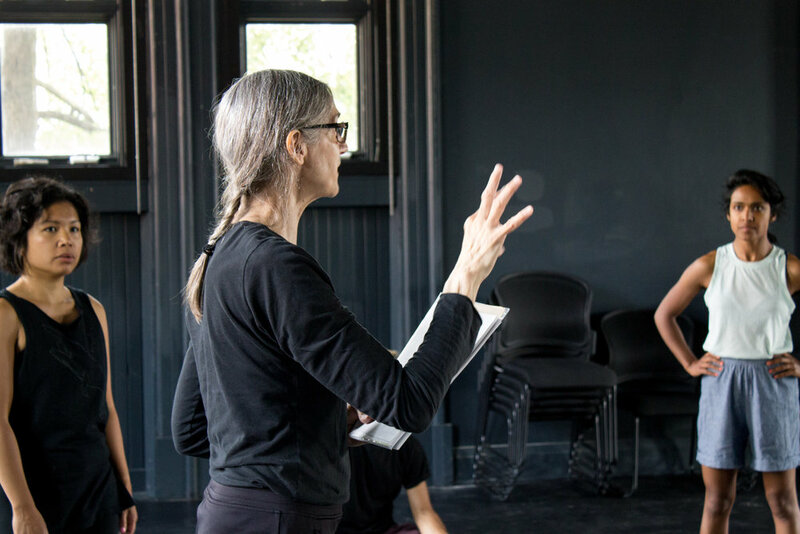 In her technique class, Peggy Baker brings the richness, depth, and immediacy of her physical practice into play in a class driven by dynamism and musicality, and focused on the expressive and kinetic potential of our bodies. The work unfolds fluidly, and with refreshing shifts of focus, through a wide range of vivid and invigorating movement explorations that address essential issues of impulse and action. Fundamental to her material and methods are the influence of neuro-muscular specialist Irene Dowd, teacher Christine Wright, and choreographers James Kudelka, Molissa Fenley, Paul-Andre Fortier, Lar Lubovitch, Mark Morris, Tere O’Connor, and Doug Varone. Creative Practice explores a wide range of powerful and innovative entry points, techniques, devices and exploratory methods for creating choreography. Neuro-muscular specialist Irene Dowd – faculty member of The Juillaird School in New York City and the author of Taking Root to Fly – has made a unique and powerful contribution to training for dancers through a series of choreographed sequences addressing specific elements of technique and functional anatomy. Peggy Baker, Ms Dowd’s assistant in the refinement of many of these sequences, is an expert guide in the exploration of this powerful work, which is available in a master class or series format. Master classes for dance students and professional dance artists can be tailored to all levels of experience and size of group, and can be based in technique, creative practice, or repertoire. Booking and information: Meredith Potter. Rosedale Heights School of the Arts, 2012. Photography by Sahara Morimoto. Movement for Actors is designed to connect with performers and creators from across the full spectrum of disciplines: singers, actors, directors, dancers, and physical theatre performers are welcome. Participants are invited to bring attention to their bodies and explore simple methods for setting themselves in motion that energize physicality, excite the imagination, establish a dynamic rapport with space, and offer the expressive freedom of being limber, alert, and responsive. Peggy Baker can teach Movement for Actors for universities, performance training programs, and specialized acting groups in Toronto and while on Tour. Movement for Actors has previously been offered at the Volcano Conservatory in Toronto. Movement for Actors as part of the Volcano Conservatory, 2016. Photography by Bessie Cheng.